We are a group of dedicated, enthusiastic energy professionals. Specializing in the provision of high quality solar and thermal solutions to private and commercial clients. GoGreen was founded in 2012 by Mr. Eugene Bester. The company is based in the Helderberg and has a long list of successful small-to-medium scale projects under its belt. The company specializes in the design and installation of heat pumps and various solar and photovoltaic systems, with a guarantee of long-term energy savings. Having had over five years of experience, the company already holds its own with the best in the industry. There is a growing concern about future increases in electricity tariffs. Many household and commercial business owners are looking for a means to reduce their electricity costs. The need for efficient and cost-effective alternative sources of energy has never been in greater demand. We offer a number of different options that suit the needs of both the private and commercial markets. Solar technology has been the primary focus for some time. The use of heat pumps in both the household and commercial sectors has also proven to offer a considerable saving of up 67% on hot water heating costs. Heat pumps and solar systems compliment each other well. 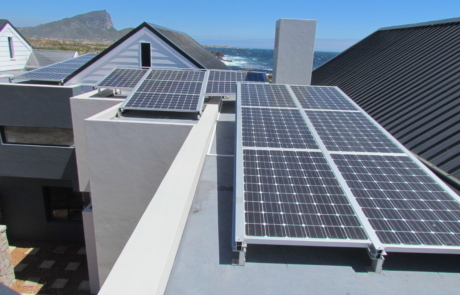 All our systems strictly adhere to SABS standards and are approved by SESSA (The Sustainable Energy Society of Southern Africa). Each system also boasts ISO accreditation. We believe in delivering quality and the presentation of evidence to prove it. Our attention to detail has resulted in a host of durable, well-designed installations as well as a string of satisfied customers. At GoGreen, word of mouth has, and always will be, our prime marketing tool. We believe each great solar job creates many more. The lucrative outlook for the solar industry leads us to be confident in its continued future growth. In partnering up with GoGreen you will not only be given solutions that fit your pocket but solutions that will aid you in becoming an energy efficient home/business of the future. We are committed to upholding our values in every project and task we take on. We are firm believers in the provision of quality systems and service. Backed by established suppliers of world-class products, some offering up to 25 years’ warranty. Every one of our clients is guaranteed specialized service tailored to their specific needs. GoGreen acknowledges the importance of adhering to standards. We ensure that all leading team members are in possession of the required certification for the job. All of our systems are accredited appropriately. Although we analyze projects on a case by case basis, this is a rough guide to the services and project packages we offer to our clients. Do you just want to save on electricity? Or you just want backup power? How about saving electricity and have backup power? All the above and store electricity for night time? Or just rant over your monthly utility bill – if it’s about energy, we can help you. We like to be informed of our clients’ exact needs and wishes – we will provide advice and means by which to achieve these needs. Your pocket and favourable price-performance ratio will be at the top of our minds. Upon acceptance of the proposal, GoGreen will get to work: you can expect a quality solution and installation. We will take care of all the admin required by the authorities. Your system will be properly registered and approved – no surprises in the future. Upon project completion, the system receives a “Certificate of Compliance” from one of our qualified Electricians. If photovoltaics are involved, a “Professional sign off” by a registered electrical engineer will also be issued.